AudioQuest Nighthawk review | What Hi-Fi? These headphones will give you gentle caressing, but no rough and tumble. We like it when a manufacturer pulls a new one out of the hat. Keeps us on our toes, it does. In this case, a renowned cable company (and the maker of a rather good USB DAC) has come up with a pair of headphones – the AudioQuest Nighthawk. 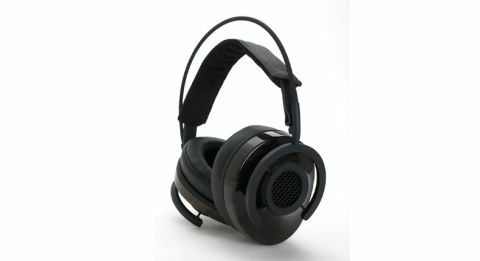 The AudioQuest Nighthawks are no ordinary headphones. There’s all manner of fancy design going on. Take the earcups – they’re made of ‘Liquid Wood’, a mixture of wood and plant fibre, which is heated, liquefied and processed for injected moulding. AudioQuest claims Liquid Wood has far superior acoustic properties compared to ordinary wood or plastic. And the earcups on each pair will look slightly different, thanks to natural variations in colour, pattern and finish. But it’s not just about the materials. There’s a really clever bit of design in the earcups, which are suspended from the headband/frame by a web of elastic material. It’s an innovative approach that means the cups have freedom of movement across all axes, which ensures a better fit. The earcups float on the side of your head, and with no excessive clamp force, they are comfortable enough to wear for hours. And the ear pads are slightly thicker at the back which helps angle the sound towards your ear canal. The headband itself has two parts: a rigid overwire and a soft strap that stretches as it sits on your head. It looks a little odd, but the Nighthawks get full marks for ergonomics. The diaphragm is made from a biocellulose material, rather than the more common Mylar. AudioQuest claims this is more rigid and self-damping, promising a more accurate and musical sound. Elsewhere, a ‘split-gap motor’ design aims to reduce intermodulation distortion. There is also a bit of loudspeaker-style internal bracing: support beams aid the Nighthawks’ structural integrity and minimise unwanted resonances. This is aided further by extra damping material made of wool and polyester. Clearly, a lot of effort has gone into designing a set of headphones distinct from anything else on the shelf. But how do they sound? There’s little doubt that these are a sweet listen. A buttery-smooth presentation and an easy-going demeanour mean you could play for hours without fatigue. Even poorly recorded music files are handled with velvet gloves. The Nighthawks ooze elegance. What they offer tonally is impressive too. If you like bass, you’re in luck; there’s plenty of the weighty, subtle sort of bass here. We’re also impressed by the solid midrange, where voices are natural and emotions are convincing. Elsewhere, dynamics are strong and far-reaching, while the semi-open design offers a good amount of space without too much sound leakage. But they’re too polite. As much as we enjoy being caressed for hours on end, it needs to be balanced with a bit of rough and tumble. Play something more agitated – anything by Three Days Grace, for example – and there’s a distinct shortage of bite. A tighter sense of timing would help, as would greater agility. Then there’s the matter of detail. There’s just enough to get the idea of texture, but it’s not the sort of insight you get with a pair of Shure SRH1540s. A cleaner, clearer sound would help, but as it is, the Nighthawks sound comparatively closed-in. We have mixed feelings about the AudioQuests. While we may enthuse about the design and ergonomics, the audio performance is a less positive area. They certainly have some admirable qualities, and while they do many things well, a few fundamental flaws hold them back. No doubt about it, these are lovely headphones – but if you’re after a good all-rounder, you could do better.